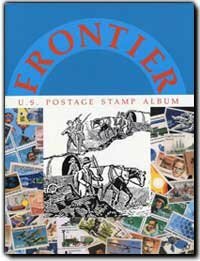 William J Kozersky, Philatelist > U.S. Stamps > Albums > Frontier U.S. Postage Stamp Album 1990 ed. Frontier U.S. Postage Stamp Album, 1990 ed. Published by U.S. Fulton Publishing Co.
Black & White images, 280 pages, four (4) of which are blank for extra stamps. 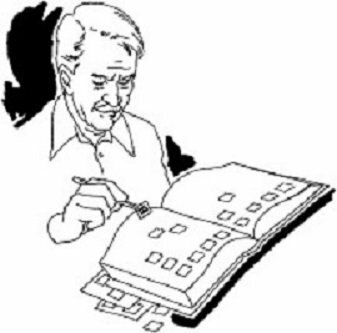 All stamps are pictured with over 3,000 illustrations, printed on both sides of page. Spiral bound enabling all pages to lie flat, when album is opened. This is a great album for the beginner collector, or someone who is looking to update or enlarge their collection. Please note that this album weighs almost two (2) pounds, and does not qualify for USPS Media Mail, and is too heavy for USPS First Class Mail. Shipment with USPS Priority Mail.